Nothing screams birthday more than a funfetti cupcake. I made a batch of homemade ones for Kent's birthday last week. 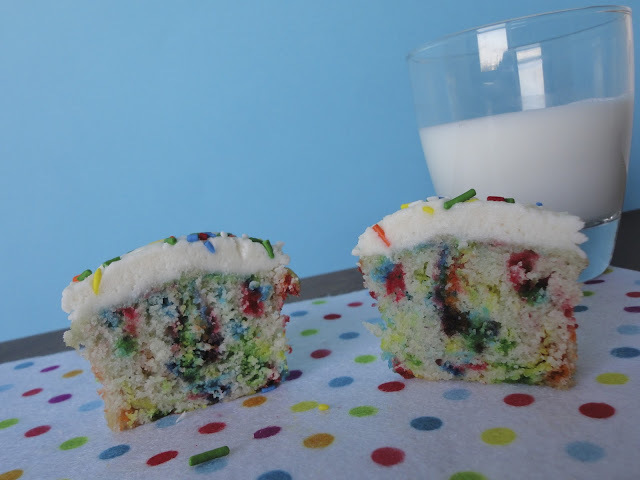 Funfetti cake is his favorite cake, but I couldn't find a great recipe for cake that didn't require complicated ingredients, so I settled for a cupcake recipe from my favorite blogger. Most cake recipes call for oil as the wet ingredient, but this recipe uses butter to add a rich buttery taste. I personally thought that it made the cupcake texture a bit too dense, but the butter flavor was delicious. I was pleased with how pretty the cupcakes turned out. The rainbow sprinkles contrasted with the white cake and fluffy white frosting look like a cup of happiness. These cupcakes were so simple to whip up and they received rave reviews from Kent's team at work. The frosting was a bit labor intensive, but it was my own fault. I bought piping tips and an icing bag so that I could attempt a professional look, but it turned out disastrously so I resorted to the ol' knife to spread my frosting. Then added some sprinkles to garnish. Homemade always beats out a box mix, so I encourage you to try making your own cupcakes from scratch. You can do it! mmmmm makes me want to go get a box of funfetti cake right now...if only I was a baker like my sister. Yum yum!